In this extended and illustrated version of his lecture, Ian Ralston considers the evidence for Pictish hill forts as it has developed since 1952. 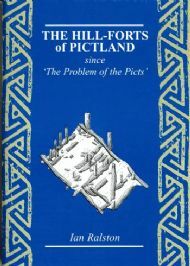 Over fifty years ago, during a celebrated conference held in Dundee, Richard Feacham provided an overview of The Problem of the Picts from a fortifications perspective. He included sites such as Turin Hill in Angus, Dumyat in Stirlinghsire and Dunearn in Fife, as well as Moncrieffe Hill and Dundurn in Perthshire. But the lack of excavation meant that his overview was necessarily dependant on form rather than material evidence or dating results. Ian's review has taken account of a range of work attempting to clarify the nature of Pictish places of power, including Professor Alcock's research programme that included excavationa at Urquhart and Dundurn and his own work at Burghead. But as he notes - there remains much to investigate.